EWB-Boston University has successfully returned from a jam-packed weekend of workshops, speakers, and subway rides in the Upper West Side. The 2011 Northeast Regional Conference was hosted by the Columbia University chapter, and they did a great job of lining up speakers, organizing the attendees, and facilitating the event’s success. In particular, the conference heralded speakers like the Executive Director of EWB-USA and a Nobel Peace Prize laureate. There were workshops spanning member and leader training, cell phone application in Sub-Saharan Africa, fundraising, and the EWB program application process. Just like the Millennium Campus Conference, we’ll be posting a series of articles featuring some of the key takeaways we identified for our chapter and the lessons shared by the speakers. So stay tuned! In the meantime, we’re gearing up to travel back to Boston and share our new ideas with the group so we can see what their take on it is and how they think we can customize it to fit our group’s needs. 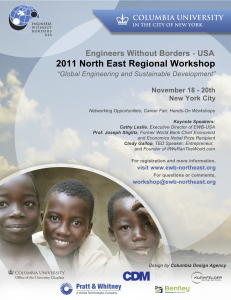 Tags: conference, EWB, NE Region, networking.